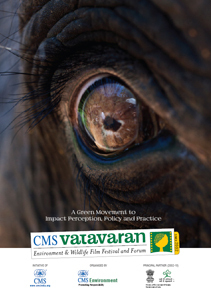 CMS VATAVARAN has successfully positioned India as a fast emerging destination for environment and wildlife filmmaking. The growing interest of the international filmmakers can be gauged from the fact that the film festival attracts filmmakers from across the globe. Consistent with past festivals, filmmakers from 26 countries entered their films in the international section this year with a total of 61 submissions. Out of which, 23 films were nominated from 11 countries. The unprecedented growth of the public participation in CMS VATAVARAN has also been remarkable. When the festival began in 2002 with just 2500 participants it was unimaginable that in just a decade we would have the privilege of hosting more than 95000 people in 8 cities of the country. The international participation has also been steadily increasing including 28 percent delegates from the USA, 23 percent from Asian countries and 10 percent from European countries. The international filmmakers have benefitted from CMS VATAVARAN by tying up with Indian filmmakers for co-productions and outsourcing assignments.